with the BGS model 105 instrument in Darwin, Australia. In 2013, samples from Krivoy Rog and Darwin were exchanged and analysed on both the Russian decrepitometer and the BGS model 105 instrument. Both instruments measure pressure changes resulting from the decrepitation of fluid inclusions in the sample, but the russian instrument measures total pressure during decrepitation in a vacuum, while the BGS model 105 instrument measures acoustic frequency pressure pulses in air at room pressure. The Russian instrument results are provided as a list of temperatures and pressure readings. It seems that the measurements are taken at fixed time intervals and the period is not specified but seems to be about 5 seconds. The units of the pressure measurements are not specified. Following an initial review of the data, a plot of the furnace temperate heating rate was prepared by plotting the temperature increase during each 5 second sampling period. This showed that there were significant problems with both the temperature measurement system and the furnace heating control system of the russian instrument. 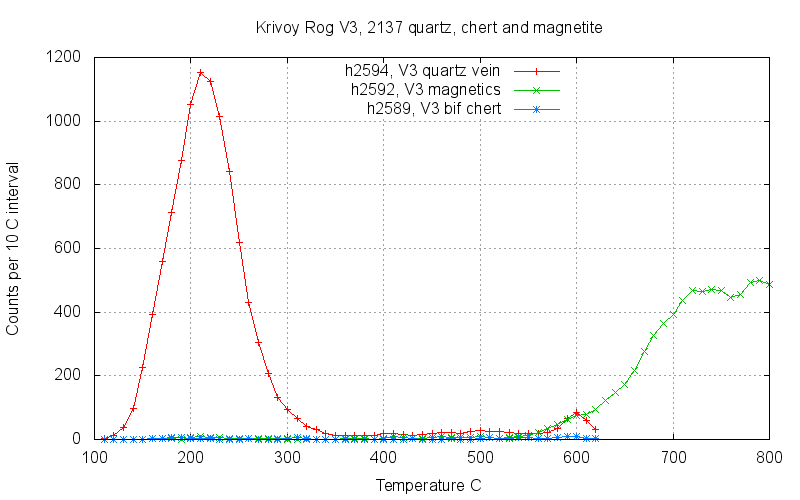 The red graph shows extreme temperature fluctuations at low temperature, probably due to a bad thermocouple system, and also extreme non-linearity and inaccuracy of the heating rate of the sample. This is a serious design problem as variations in the heating rate will affect the decrepitation data. 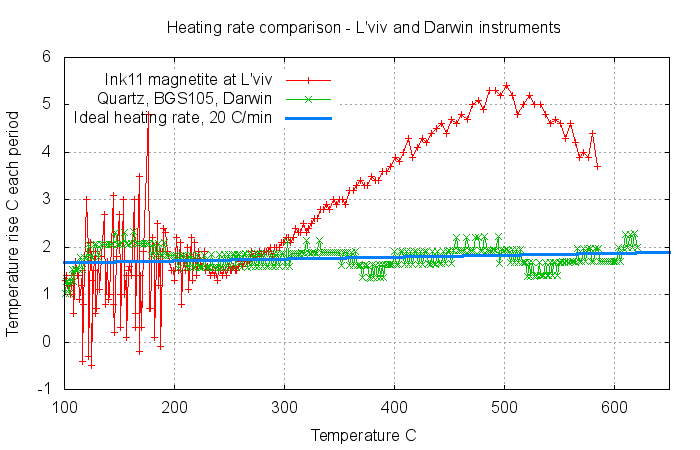 For comparison, the heating rate for the BGS model 105 instrument is shown in green. This shows a well controlled and constant rate of temperature increase throughout the analysis of about 1.7 degrees Celsius per 5 second interval, or 20 degrees Celsius per minute. At the BGS laboratory, a standard sample of Howley quartz has been used for analytical quality control since 1984. An aliquot of this material was sent to L'viv for analysis on the russian instrument, and the result was compared with an analysis on the BGS model 105 instrument. The result in red (from the russian instrument) bears no relation to the result in magenta (from the BGS model 105 instrument). The intense peak at 200 C on the russian instrument is a concern and perhaps this is due to desorption of water on the sample rather than to fluid inclusion decrepitation. The absence of peaks at 500 and 600 C may be because the inclusions are small and hence do not contribute significantly to the absolute pressure of the russian instrument when they burst open. But the BGS instrument counts individual pressure pulses and is little affected by the volume of the inclusions. 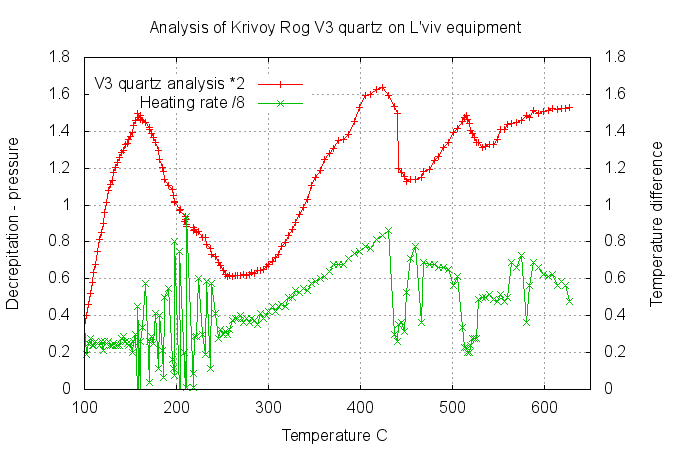 The green graph shows the heating rate of the russian instrument during this analysis. Once again there is random noise in the temperature system, but also lack of heating rate control above 350 C. This excessive heating rate might be causing the gradual rise in decrepitation above 350 C on the russian instrument. 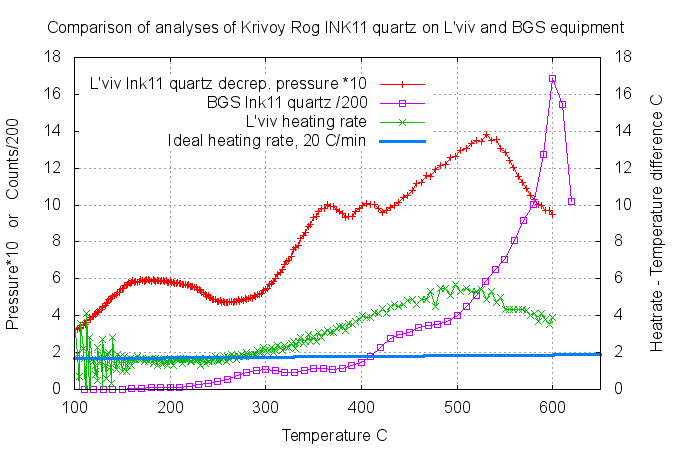 Samples from the Krivoy Rog mine in Ukraine (sample Ink11) were also analysed on both instruments. The 2 aliquots were not completely identical splits of the same rock and there may be a small sample variation between these 2 samples. Once again there is almost no correlation between the results on the 2 instruments. The peak below 200 C on the russian instrument (shown in red) may be due to water desorption. The heating rate of the russian instrument, shown in green, is again improperly controlled above 300 C. This excessive heating rate seems to be at least partially, if not substantially, causing the rise in decrepitation up to 550 C and its decrease from 550 C to 600 C on the russian result. But when the heating rate is plotted (green curve) it is clear that these decrepitation peaks are caused by the severe irregularities in the furnace heating rate. This result, which is typical of many russian decrepitation analyses, must be regarded as completely spurious and caused by dysfunctional analytical equipment. The result is not due to fluid inclusions in the sample at all. The quartz in sample V3 was also analysed on the BGS instrument and is shown in red on this graph. The prominent decrepitation peak near 200 C is seen on the results from both instruments. This peak is caused by CO2 rich fluid inclusions. 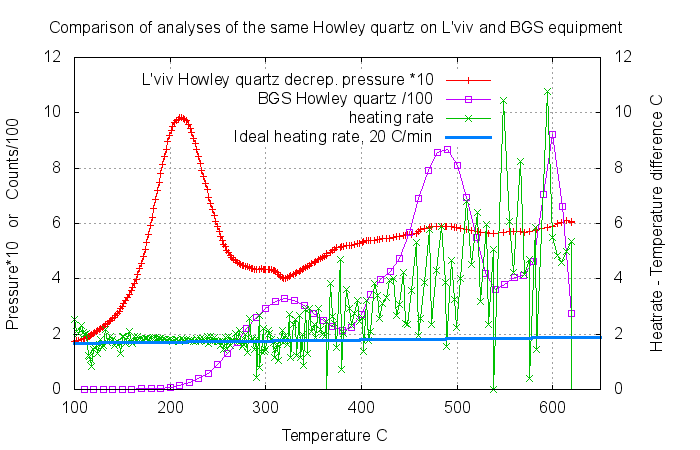 But there is no decrepitation at higher temperatures on the BGS result. The decrepitation peaks at 400 C, 500 C and 600 C on the russian instrument result seem to be merely caused by the extremely bad heating rate control of the furnace and erratic temperature measurements and are geologically meaningless. The results from the russian decrepitometer in Lviv do not match the results on the same sample using the BGS model 105 decrepitometer in Darwin. This is in contrast to the good match in results between the chinese decrepitometer in Beijing and the BGS model 105 decrepitometer in Darwin. There are significant instrumental issues with the Russian instrument, which does not have adequate control over the heating rate and suffers from variable random noise in its temperature measurements. The inadequate heating rate control seems to be a design problem and probably affects all the results from this type of instrument. Analyses of other samples often show strange peaks in decrepitation such as in sample V3 above, which are clearly correlated with erratic heating rate of the sample. Decrepitation analyses carried out on these instruments cannot be trusted and almost certainly show spurious peaks which are not a feature of the fluid inclusions in the sample, but are instead an instrumental artifact of the inadequate heating mechanism of these instruments. The spurious results often reported from these russian instruments has caused people to assume the decrepitation method does not work. This conclusion is incorrect and unfortunate because the problem is in fact due to this particular instrument, which does not work properly. Results from these instruments should not be accepted. Other decrepitation instruments do produce consistent decrepitation data which is solely caused by fluid inclusions in the samples. The decrepitation technique does work well when using properly designed equipment.